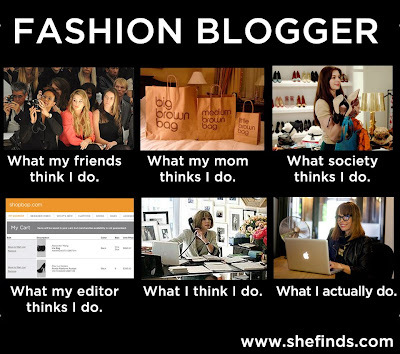 What the hell is a "Fashion Blogger"? Monroe Steele can do no wrong in my eyes. I mean she is THEE Fashion Blogger of everything. I recently came across an article that she posted on her blog called “What the Hell is a Fashion Blogger?” And it was a great post. As a Fashion Blogger myself I get asked the same damn question. Many people think a fashion blogger is one to attend different events and shop. This is TRUE but for me it is MORE than that. 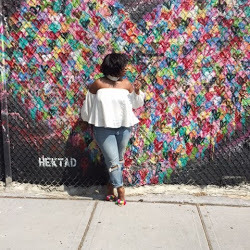 I started by blog over two years now and my baby has grown and matured into something that I am proud of... something that I included onto my resume... YES I DID include it. A Fashion Blogger is “ME” a compulsive shoe lover… girl talk... finding the BEST sales... deal… sample sales… blogging... networking…promoting… styling…editing...meeting new people attending events… interviewing and writing about it. I know I may NOT be the best fashion blogger but right now dammit I am getting there and I am having fun in the meantime. OH and…… I get emails everyday about my “Street-Style” pictures A Fendi Bag Tee’s and MORE shoes features. I have a brand new photographer and we will be in these mean NY street taking pictures in the beginning of the New Year. The New Year will also bring “A Fendi Bag Tee’s” and YES they will be on SALE in February. As far as shoe features I am working on more features/interviews with some of my favorite designers, shoe stores and a possible SHOE GIVEAWAY coming SOON! Yes, Tammy!!! Go girl! I think you're a d@mn good fashion blogger and I love stopping by your blog and finding out about the latest fashion trends. I wish you all the best in your endeavors, blogging or otherwise, and know I'm over here rooting for you girlie! Looking forward to seeing more from you in the near future. Maybe we'll even get to meet up at one of these blogger events in 2013 and work together on something soon! awwww YES Tammy! I love it, I love it! this just gave me LIFE, a warm smile and mainly inspiration! don't you just LOVE Monroe she really is the best! And I look up to you girls all the time. you know that. Hope to see you tomorrow! mis you! I loved this! blogging is not just a hobby, its some of our lives!